“I don’t think that it really hit me until I was pulling up to the stadium. Being on the field before the game got a little emotional. I felt like it was a pretty good day, I felt like I left a lot of plays out there a few plays here and there, obviously the interception I just got a little antsy Mewelde Moore was open I wanted to get him the ball right away when I needed to just settle down and get it to him. That being said we won the game and did pretty well on offense.” — Ben, during his post-game press conference. On a near-perfect fall afternoon, Ben Roethlisberger returned to the Steelers and the National Football League with a performance that almost was as splendid as the day. Starting with a rousing ovation from the forgiving season-ticket holders and interrupted only by an early interception, Roethlisberger was pretty much the elite quarterback he has become. There was scant evidence that he had missed the first four games and hadn’t played since the exhibition season. You can read the rest of Mr. Smizik’s blog here. Ben Roethlisberger, cheered loudly during his first game in 91/2 months, shook off the rust from his four-game suspension to throw three touchdown passes, and the Pittsburgh Steelers shut down a depleted Cleveland Browns offense during a 28-10 victory Sunday. With the Steelers (4-1) leading 7-3 but backed up to their own 4 late into the third quarter, Roethlisberger — flashing the big-play ability his team lacked without him — completed passes of 50 yards to Mike Wallace and 36 yards to Heath Miller on successive plays. Three plays later, Hines Ward fought through two potential tacklers on an 8-yard touchdown catch that made it 14-3 and gave the Steelers’ defense all the points needed on a mostly dominating day. The Browns fell to 1-5. The Steelers had Ben Roethlisberger back from a four-game suspension, and he engineered a five-play, 96-yard drive in the third quarter putting Pittsburgh in charge, 14-3. He was knocked down but still delivered a 50-yard pass to Mike Wallace. Roethlisberger never saw the completion, as he was on his back in the end zone. Two Browns blitzers were a shade of a second too late. 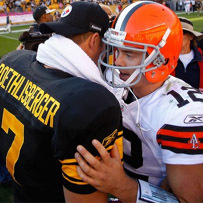 Then the Browns didn’t blitz, and Roethlisberger threw a 36-yarder to Heath Miller. When the Browns blitzed, they were too late. When they rushed three men and tried to cover with eight defenders, Roethlisberger stood in the pocket long enough to bake a cake — and picked them apart. You can see photos from today’s game at NFL.com here. More photos are here. You can read post-game quotes at Steelers.com here. You can watch NFL.com’s “Ben Roethlisberger game highlights” video here. Roethlisberger also discussed how he and his family had to deal with the accusations against him. “You get accused of things and it hurts, especially when you know that there is no truth to it at all. I could sit here and say honestly that I would never and have never harmed a female and never would. I mean, I have a sister. I’m the only boy in the family, I’m the only grandson. So, I would never ever do that and there’s vicious allegations that are not true and it does hurt and it’s not fun to be accused of things,” Roethlisberger said. KDKA has more on the interview here. “There was a time when I was going through all this that I contemplated not playing anymore. I didn’t want to be Big Ben anymore. And I know that’s what goes along with being No. 7 of the Pittsburgh Steelers. So part of me, I can admit didn’t want to play anymore. ESPN has part of the interview here. I will post a link for the full interview when it becomes available.